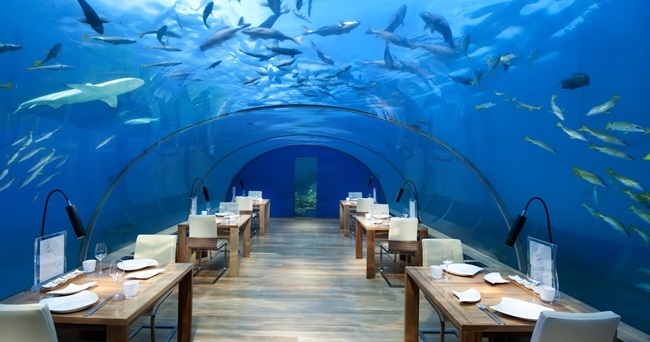 Almost 10 years ago, the world’s first all-glass underwater restaurant was opened in Maldives by Conrad Maldives Rangali Resort. 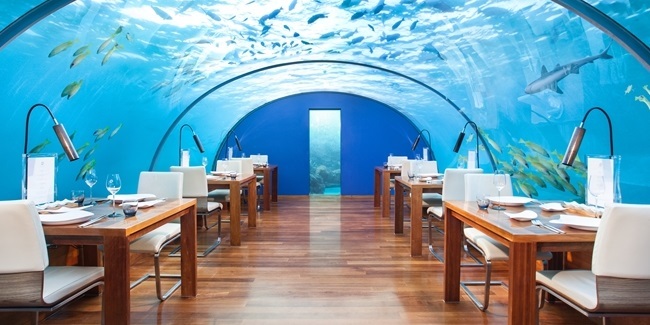 Ithaa Underwater restaurant was stunningly descended five meters into the breathtaking waters of the beautiful Maldives. Ithaa in Maldivian Dhivehi language means a pearl. As the name indicates, this inimitable, unique restaurant is like a pearl beneath the waves of the Indian Ocean. Ithaa Underwater Restaurant is enclosed in a curved acrylic wall which provides the capacity of 14 people visitors with a 180-degree panoramic view. This gives the visitors the pleasure to enjoy a spectacular view of the beautiful lagoon’s underwater while relishing the contemporary European cuisine in a six-course set menu dinner. This is the first of its kind restaurant in the world where the visitors get the propitious opportunity to gaze into the clear lagoon and all the magnificent, colourful coral gardens, tropical fish and reef fish in it. As a result, Ithaa restaurant is being counted as one of the most beautiful restaurants in the world. This however has made the restaurant to be amongst the most expensive restaurants where you can dine in since this is one of the most high-class, elite places one can visit after all. It has already been appraised as “the most beautiful restaurant” by the New York Daily News in 2014. Conrad Maldives Rangali has so far made various trends in the resort dining by providing the visitors with something exclusive such as offering fascinating surroundings. 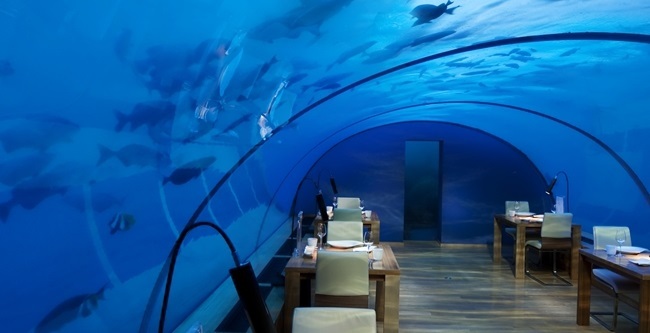 Being the first resort to open an underwater restaurant in the world, Conrad Maldives Rangali was also the first to build an underground wine cellar and the first to establish a cheese bar. It was also the first resort to invite world-class chefs and winemakers to its island. It is regarded as to offer the region’s largest wine list with around 20,000 bottles of approximately 1400 labels in the wine cellar. The resort has proved that the isolated location would not prevent a determined, luxurious resort from achieving continuous fineness or from setting the bar higher for other competitors. Conrad Maldives Rangali also has 11 other restaurants and bars with distinctive and separate menus which also include the recently opened Ufaa by Jereme Leung, one of the most creative Asian pioneer of Modern Chinese Cuisines as well. All the restaurants in the resort could be rated among the finest restaurants in the world for its miscellany of cuisine and exceptional scenery.